Covers gear and tackle, fly selection, casting, setting the hook, playing and releasing the fish, float fishing Insight into a wealth of fishing experience from one of the most well-known fly fishers in the sport today Illustrations by Dave Hall and photos by John Gierach Through his accounts on the water, author A. K. Best shares his lifetime of fly-fishing experience. "I have always thought that going fly fishing simply meant that you drove to the stream, strung up your rod, tied on a fly, looked for a rising trout, and then cast to it until you caught it. It does work out that way sometimes and it's a lot of fun. But other times, it gets a little more complicated and that's even more fun." 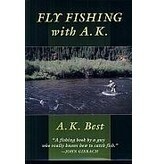 It's these complications that A. K. deals with, untangles, and explains in his first book devoted to fishing.